A master suite with at least a half-bath. An office space that would fit both of us. Windows to provide light and sightlines. 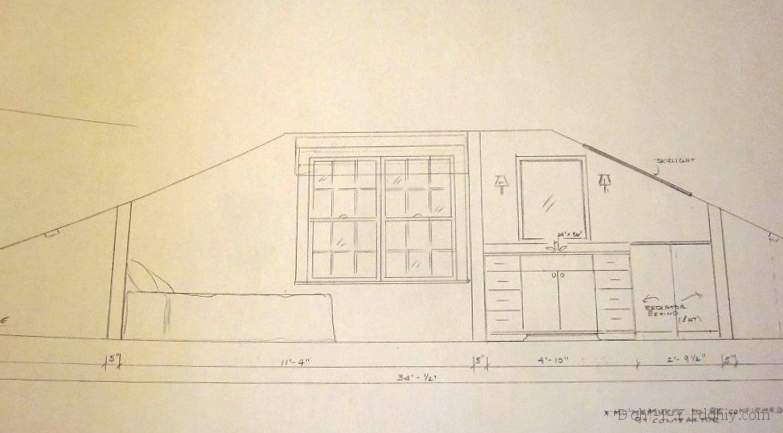 At our earlier meeting, we told our designer we were open to adding a dormer if needed to achieve our goals. But after measuring, the designer said she thought that we could do everything we wanted without building out. The Kev said my face just fell when she said that, which surprised me — not building out would be a far cheaper option, and I am known to be careful with a dollar. But I’d been pinning dormers and balconies and expanding the space seemed so exciting. When the designer called to make the appointment, she said that she had two plans; neither involved a dormer, but there was more floorspace. I was intrigued! The designer brought a whole sheaf of drawings. I was going to scan them, but they were too big for our scanner, so I just took pictures to give the general idea. 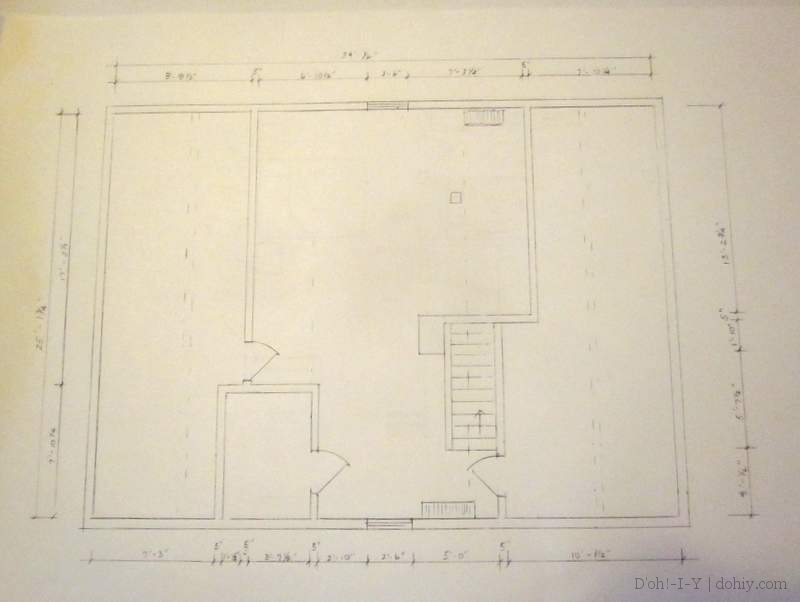 Here’s the base drawing of the space as it exists. The peak of the roof runs top to bottom here, so there’s attic space on the left and the right. Once you’ve got that, you can see we’re talking about a long room running the width of the house with two little windows in either end. The first plan stayed within this footprint and even kept the closet intact. The windows were doubled, and one attic access door moved about a meter. There’s a bathroom with shower and an office alcove. The next version was more complex, and involved taking some floorspace from the attic around the edges and at the top of the stairs. A reading nook at the top of the stairs with bookcases nestled into the wall. An office where the closet currently is (opposite the reading corner). Office storage built into the knee-walls to maximize space. A walk-in closet and a linen cupboard (across from the bed). A built-in bench on the office side of the stair railing. A series of four skylights along the backside of the roof (indicated with dotted squares on the right side of the plan — there’s one right on top of the toilet, for instance). That is a LOT of stuff to put into this space, and it’s everything we asked the designer to do. And we had a really pleasant meeting with her to talk through all the options — she also had sample pictures and product ideas and all sorts of good stuff. But…as I pored over the plans after the meeting, I found myself feeling a little disappointed that there wasn’t some sort of magical breakthrough for the space. I mean, WHERE ARE MY FRICKING MINARETS, PEOPLE!? My flying monkey aviary?! And there is NO WALK-IN HUMIDOR anywhere in this plan!! 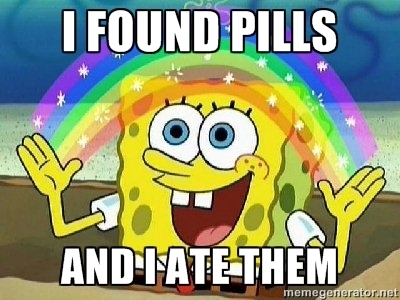 And around then, I realized I was not simply cranky but actually unwell and in need of large pills. “And not before time,” quoth the Kev. Twenty-four hours later, the drugs had kicked in (wooo!) and I could look at the plan and the process more objectively. When we did our kitchen, we were much less experienced, and the door-moving revelation hit us like a bolt from the proverbial blue. 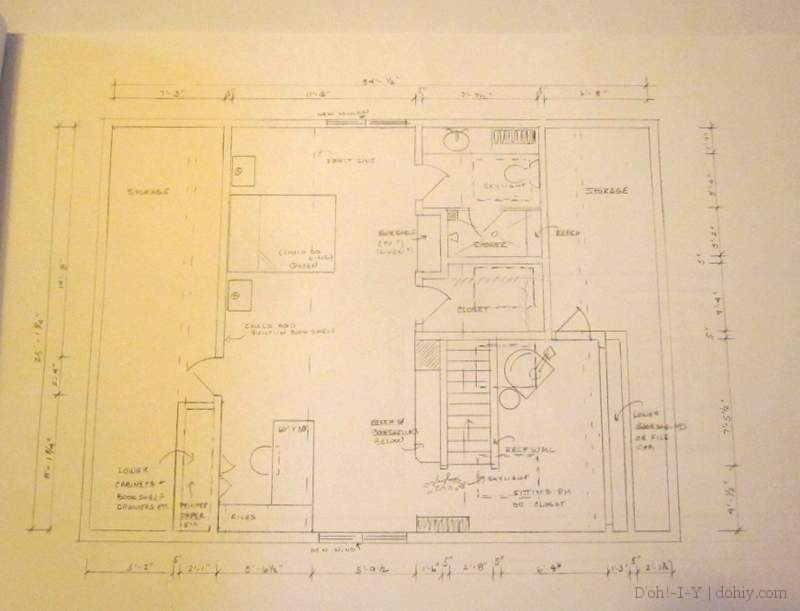 By contrast, we’ve been playing around with ideas for renovating the upstairs for over a decade, so there was nothing in these plans that we hadn’t considered in some form along the way. A bolt from the blue moment just was not likely, or even necessary. 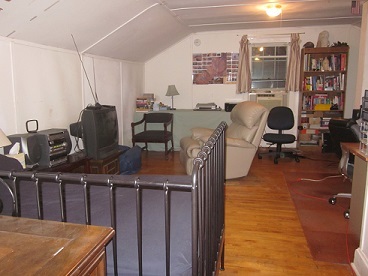 This is not a huge space, and there are a range of constraints — the stairs, the existing plumbing vents, the chimney, the roofline, our not-wealthiness. And our wishlist was pretty long to cram into among all that. The designer did a valiant job corralling everything so nicely. I love the linen closet/built-in idea (opposite the bed). Nice use of a little sliver of space. The closet makes more sense to me back-to-back with the bathroom, as it is in this version. The office space is better further away (no office right in the bedroom, please!). I like the even spacing of the skylights (because I like symmetry). We like the reading corner concept; it will open up the feeling of that end of the space. The double windows are definitely going to be in the final mix. The sunken-into-the-wall office storage makes good sense. We like the built-in bench idea — we’d thought of seating there, but not built-in. Could look original if done right. Where does that leave us with regard to the design phase of the project? After presenting and discussing the plan, the designer said we should mull it over and give her a call with any questions. Once we’ve talked it through thoroughly, she could make changes if the drawings helped us refine our thinking. We have the plans spread out on the dining room table, and we each flip through them from time to time. While we like the plan, our initial feeling is that perhaps we’ve demanded too much of the available space. But we’ll let it all percolate for at least a week before assembling our questions and deciding whether to have the plans updated in any way. Ok, time for my next pill — while I do that, let us know what you think of the plans. Are we trying to squeeze too much in? 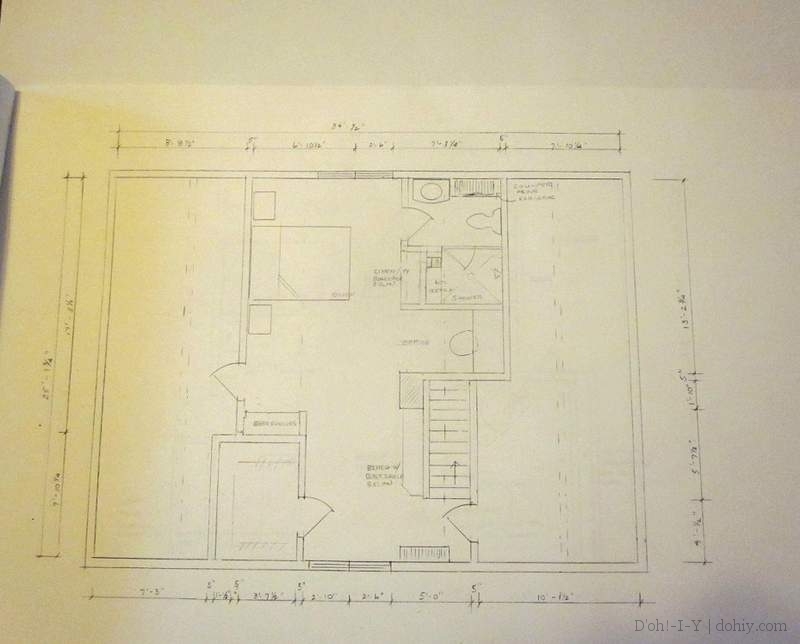 This entry was posted in Construction, Organization, Walls & Floors, Windows & Doors and tagged floor plans, home improvement plans, how to review interior design plan, how to work with an interior designer, interior designer. Bookmark the permalink.